Blackjack rules are the first thing every newcomer learns when decides to become a professional of blackjack card game, and it is right actually: together with the game's objective, basic blackjack rules help you to understand the game perfectly and determine your chances for winning at once. The rules of the game include bets, card dealing, options of a gambler and rules for a dealer; they are not difficult to remember and follow: the main thing is to use them properly to increase your chances for winning. Bets are always made before the cards are dealt. 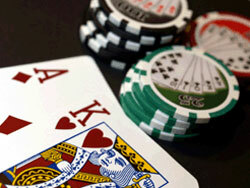 Remember, that you do not have any right to touch chips or change your bet after the cards have been dealt already. Two cards are dealt both to a player and a dealer: a player's cards are faced up, a dealer's one card is faced up and another one - faced down. After that a player decides what to do next; as for a dealer, special rules exist concerning his/her behavior during the game. When you have 2 cards of the same value (two 8's, two 9's etc) you may split them and play with two separate hands. But your bets for both hands should be equal. Means asking for ONLY ONE MORE card and doubling your bet; remember that after doubling you have a right to take only one card and it will be your final result. It is an additional bet you can make when you are sure a dealer will have Blackjack; if this bet wins you receive your insurance bet doubled; if not - you lose your insurance bet and continue playing with your initial bet. When you see that your result is not good for winning and you can do nothing to improve it, you just give it up and lose your bet. Blackjack rules for a dealer are usually determined by a casino itself; a dealer also has a right to hit or stand: usually, s/he SHOULD hit when s/he has 16 or less points and s/he SHOULD stand when he has 17. So, if you know card counting for example you can easily operate with this rule for improving your chances for winning blackjack card game. Blackjack is the hand of 2 initial cards which brings 21 points to a player at the very beginning of the game. Usually, this is a combination of an Ace and any card which gives 10 points. The payout of Blackjack is 3:2.